Mike H, Sten, Brian The tide promised 9.7 m. On arrival at Arnside promenade there seems too much water. Tide time wrong. No but unusually only 5h 20 min been low and high water today.it was a chilly 4 degrees. Just dawn at 8.00, dull gray skies of so many shades reflected in the grey water. Even the orange sand issued gray tinge. More browny grey water flowed over the sands to out right. As we paddled past New Barns bay, Sten gave good chase, for meagre rewards. well at least we saw a lovely white egret. 22nd Dec . The rain gods had been kind. Supplying 0.94 on Lunes Brigde gauge, perfect for improvers but enough for the more skilled to play. A good turn out. Mike H , Sten, Emma , John H, Brian, Sue, Ian H, Ian Mc, Colin, Rachel, Nigel, 11 in all; met at Tebay, Lunes Bridge. Some of the more skilled decided to Tebay entry rapid a go. Score 4:1 to the paddlers. One swim rescued. around the bend. Then the rest joined, grade 2 with large eddies enabled the improvers to improve and all to play. Then stop – 2 otters making their way upstream until they saw us 50m away. Frequent boulders and rapid brought su to an island. A quick look to discuss lines for the improvers. Demos watched route selected. all but one success. But he did choose the more challenging route. Now slightly easier but still flowing. As we floated 23 m from the bank a young otter, entertain due, until it git a surprise as it’s head emerged to breathe. More fun, more waves, some to play in. Thanks to Rachel for the Xmas cake. Kayaking and Ear Problems….’surfer’s ear’….an inconvenient truth! Many of you will know me as the non-paddling bloke who has helped organise the odd lecture or film festival for Lakeland Canoe Club. It was not always like this! Since I relocated from South Yorkshire to Kendal in 2015, I have not paddled many times as I have been experiencing recurring problems with my ears – a condition that is commonly known as ‘surfer’s ear’. Infections, blockages, deafness and dizziness have all become frequent experiences but, like any seasoned, old school kayakist, I just ignored these minor irritations and accepted that it is the price to pay for the thrills and pleasure of whitewater, surfing and occasional sea paddling trips. Unfortunately, I ignored the medical condition too long and have had to undergo painful treatment at Royal Lancaster Infirmary…..but more of this later. Before offering a warning and going into the gory detail of my medical condition, a brief history of my paddling career to offer some context to this saga. I started paddling at age 15 years old (rather scarily, over 55 years ago) with my first taste of kayaking adventure was surfing with a school friend at Saundersfoot, South Wales. The boat was a canvas single seater which we paddled together (very snug) with no spraydeck, buoyancy aid or airbags! There was not much recognisable as surfing but somehow we avoided drowning, had lots of swims and simply laughed our way through the experience…….I was hooked! In the coming years, I served my kayaking apprenticeship in homemade, glass fibre boats on the rivers of Yorkshire, Derbyshire and N Wales with the occasional foray to the Yorkshire coast to surf or do a trip….happy days that meant 1 day paddling and 3 or 4 days repairing the boats. Fast forward a couple of decades during which time as a teacher I picked up personal and coaching qualifications, paddling at every opportunity and introducing many youngsters and teachers to the wonderful, wet (and often) cold world of kayaking. During the period my family were growing up, along came the ‘plastic revolution’ with new, radical design boats (eg Spuds, Dancers, Corsica S etc); the opening of artificial sites in the 1980s (particularly Holme Pierrepoint, Afon Trywern and Teeside); and generally better equipment (eg Palm, Yak, Werner et al). Then kayaking went into ‘three dimensional mode’ as the ‘new’ sport of ‘hot dogging’ became popular with competitive ‘rodeos’ and ‘radical moves’ – if you managed an ‘ender’ you were cool; if you managed a ‘pirouette’ followed by ‘surfing a stopper’ pretending to ‘play air guitar’ you had a good chance of winning a bottle of Jose Cuervo Tequila! Then came ‘the Scottish years’ using the rather sketchy guide book written by Ian Lochead + Phil Todd we paddled (or portaged!) most classic rivers with some epic moments (eg verglas in the Spean Gorge, Findhorn with Andy Jackson, shuttle on bike in blizzard in Glen Orchy etc). All this meant spending significant periods getting trashed in stoppers, upside down….or swimming! My first visit to the Alps did not come until I was 40 years old and the next decade was spent mainly in the Briancon area where we had a home for 5 years with the odd visit to Austria, Italy and Slovenia. By this time most of my paddling mates were injured, giving up, getting divorced, discovering other adventures or all of these together! I was about to ‘hang up my paddle’ just as my son started his ‘year out’ that actually spanned 10 years of travelling the globe as a ski saisonnaire and raft guide/safety boater. What could I do? As part of my parental responsibility, I was obliged to visit my son and paddle on the Ottawa, the Zambesi and the White Nile, the latter on 3 separate occasions to celebrate surviving to my 60th year! that history, you will appreciate that a lot of water has passed through my ears during all this time! Over the last few years, it became harder to clear my blocked ears after kayaking or surfing and I did experience a few minor infections. When I remembered, I did wear ear plugs but found they did restricted hearing to a degree and hindered communication on the river. However, in August 2017 I went to a favourite old haunt in Northern Spain and, as usual, thrashed around in the surf on a board, in a kayak and went swimming in the breakers without ear plugs. This resulted in really painful ear ache for several days on a scale I had never experienced before – the only option was to go to the local Spanish A&E and seek advice and treatment. I was greeted with some mild amusement with my E111 card and reminded that it would only be valid for another year….thanks Brexit! Within minutes, I was ushered into the doctor’s surgery who diagnosed an infection, prescribed anti biotics, advised that I do not go in water and suggested I arrange to see my GP on return to the UK. Dutifully in September 2017, I arranged to see my GP, Dr Bruce Helme, at the Station House Surgery. Fortunately, Dr Helme had spent time working in New Zealand and, having been something of a surfer, immediately recognised the surfer’s ear condition. Basically, surfer’s ear is a narrowing by bone growth (exostosis) of the outer ear canal to protect the inner ear and ear drum – quite a sensible defence response. The problem is that water and debris can get in but cannot get out leading to infection and putrid discharge – this is what causes the earache! We discussed the nature of the condition and the options of surgery but advised against as it is unpleasant, not always successful, can cause damage to nerves in the face and may require a lengthy recovery period. He advised that I should always wear ear plugs and that we should keep the condition under review. All went well for the next year – I kayaked in Slovenia, surfed and swam in N Spain and went swimming in the UK always wearing ear plugs. Then, in Sept 2018, after entertaining my 18-month-old grandson in the Riverside Hotel swimming pool (without ear plugs), I experienced intense earache, chronic deafness and bouts of nausea and dizziness. Without overdramatising the situation, this was one of the most painful and disconcerting periods of my life that lasted several weeks. After several sleepless nights, I was back at the doctor’s surgery and after a quick examination Dr Helme diagnosed a serious infection in my right ear, called the Acute Surgical Unit at Royal Lancaster Infirmary and, to my surprise and delight, organised an appointment the very next day with Mr Eltabal, ENT consultant – good old NHS! Mr Eltabal was outstanding in terms of his care, understanding and professionalism. He explained that the only effective course of action was to probe through the narrowed ear canal and try to remove the debris and infection. If you can imagine having root canal treatment without an anaesthetic, then you begin to understand what this procedure involved! Simply, it involved using a micro suction pump (felt like a Henry Vacuum!) and a curette, a surgical instrument for scraping and cleaning (felt like a pick axe!). He removed lots of grit, debris and gunge (a skip full a la Hancock?!) that clearly had been in my ear for some time and then ‘injected’ anti biotic ointment that lasted until the next treatment. Mr Eltabal informed me that my case was being discussed by at the ENT team meetings because it was ‘really interesting’! With my fame for having ‘interesting ears’ spreading rapidly at RLI, Mr Eltabal called in his colleague Mr Raheem for a second opinion and, much to my relief, they agreed that surgery would not be necessary at this stage. Over a 3-week period, the excruciatingly painful process outlined above was repeated until, eventually, the infection cleared, my hearing was restored and I was discharged. But not before Mr Eltabal had gripped my arm firmly and made me solemnly promise to avoid immersion in cold water and to “always, always wear ear plugs in water, even when showering”!! What is the point of writing this saga? The answer is that if a few folks take heed of these gentle warnings and take some simple action you will save yourselves a lot of unnecessary pain, medical treatment and possibly worse in later years. 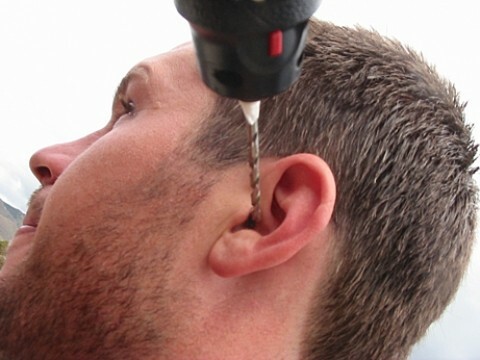 To avoid developing surfer’s ear always wear ear plugs – ear plug technology has improved tremendously in recent years. If you really want to be extravagant you can get custom made ear plugs but they cost well over £100. Personally, I like Doc’s Pro Plugs that work for me and are only approximately £15 – a small price to pay to avoid lasting damage to your ears. Additionally, there are some excellent products on the market that address the issue of keeping water out but letting sound in – have a look at these web sites but, be warned, there are some gruesome pictures! The various suggestions were reduced to one, the Ribble from Helwith Bridge to Settle, with the infamous twin bridges section. Soon after the start the speed of the flow increase. The gradient increase, the boulder size increase. The route not at all obvious, unless you recall but from last time, or follow that chap in front. but still it isn’t at all obvious until you just see it before you slide over. Some ever so steep piles into holes and cushions, ahh! but all just run through nicely- just keep relax keep it pointing downstream and steer and support and breathe. Adrenaline levels increase, shouts of joy or was it relief from Tom. Super in fact. Then the same again, only more of it. After you- no after you , I insist! Stainforth force more exacting, more challenging, quite frankly more scary. Don’t be silly we portaged and recalled how the seals do it. More lovely waves, interspersed by longer flatter but flowing section followed. One even hid a square boulder to start the fish survey again. No harm done. On Monday the 10th we took a break from whitewater action and enjoyed a more leisurely trip on Windermere. A total of thirteen paddlers made it to Red Nab, just south of Wray Castle for a sea kayak trip round the lake. It didn’t start well; a film crew had commandeered the car park, but with some tact and good humour, we managed to get our vehicles parked and boats unloaded without too much drama. The day was a bit cloudy, but virutally flat calm as the pictures show, which was good news as several of the paddlers were guests from Kendal and District Cycling Scene, and some were returning to kayaking after a long break. We paddled north along the west shore up the Brathay to the road bridge. A few more enthususiastic souls demonstrated that you can break out of an eddy in a sea kayak, and then we headed for the YHA for soup, cakes and coffee Then a rapid return down the east shore and back to our parking spot.A grand day out.We plan to do a similar trip in the New Year round the south end of the lake, so keep an eye on the calendar. The weather forecast lady on the BBC was warning of EXTREME conditions today with freezing rain and gale force winds scheduled for later on with snow. – good day for novices then! Brian, was our leader with Mike H, Sten, along to pick up the pieces, Emma and Sue refreshing skills and newbies Colin and Eric hoping not to become the pieces. With 8km to go and the doomladen forecast ahead the plan was for a straightforward paddle with not too much playing around. The numerous smoother sections allowed everyone to keep reasonably warm in between the splashing and wildlife watching was quite good with a couple of nice views of a Kingfisher moving along the bank just ahead of us. We could have used professor Hooson’s expertise at the put in though to identify the tracks in the sand. Inevitably there was some playful competition around some of the rocky bits with Mike and Brian floating gracefully up and around a strategically place lump. Others followed with differing degrees of success. Sue appeared to have the most fun in her attempt judging by the somewhat less than ladylike expletives. Less spectacularly I felt I’d executed a rather cool break into an eddy; less cool when I was accosted by an over friendly Alsatian who must have thought someone had thrown him a large green beachball to fetch. The owner walking along the bank had that “what the….” look. Brian’s brief that the only tricky bit was right at the end, but a little adrenaline keeps you warm and we were all safely back as the weather started to turn from cold and grey to not nice at all. No swimming and lots of confidence building stuff aswell. Although in the Golf Cub Café, a Latte seemed to be 20p dearer than the equivalent Americano with hot milk – but then I never understood golf. Once again many thanks to those who take the time to help and accompany the less competent; and to Brian for the leadership – it is much appreciated. Monday 3rd Dec Barry Phil Mike S Heather Peter and 2 guests. After the weekend rain we were spoilt for choice, but most fancied a gentle run out, so we did the Rothay from Grasmere down to Ambleside. Normally this involves expensive parking in Grasmere village, but Barry has many friends, including a lovely man who owns a house with a car park overlooking Grasmere. So we went there. Seven paddlers ran the river in some style, the level was great at circa 1.01m, so most of the scrappy bits were smooth and flowing, and there were play waves where usually there are rocks and shingle. Blue skies and sunshine enhanced the mood. Some fool has put a suspension bridge up just above Pelter Bridge, which we all steered round. One paddler tripped over a rock in the rapid and had a swim, but no harm done. Then on down over the (well covered) stepping stones and through the trees to the get out. Enthused by this success, three paddlers went on to run the classic middle section of the Lune down to Killington. This is normally the place you go when everything else is empty, but with the gauge at 0.95, it was a fast, bouncy run, with loads of standing waves and confused water, especially in the gorges. Phil swam once, rolled twice, and improved his batting average on the Strid to 0.57.